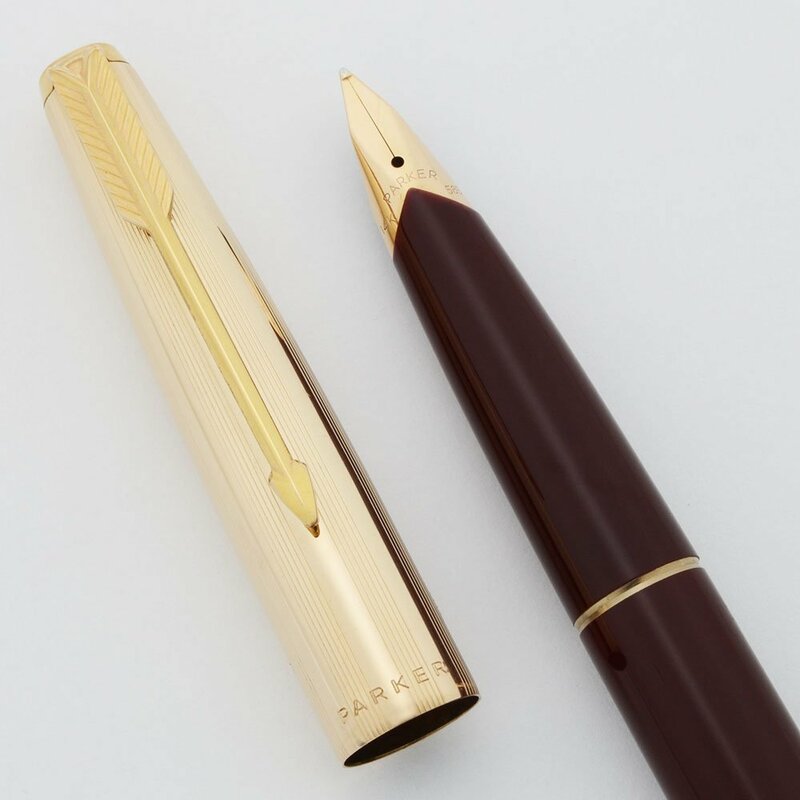 Parker 65 Flighter Deluxe from the 1970s. Rage Red (or maroon) barrel and section with 1/10th 12k rolled gold cap and trim. Medium-broad 14k nib. Superior condition. Manufacturer and Year Parker, made in England -- 1967 - 1982. The maroon color was introduced in 1969. Filling System The fountain pen has the "VS" converter with the thin stem. As these are prone to breaking, we did not remove it, however the pen filled well. It does not accept cartridges, as we believe it is the Mark I version of the pen. These converters are very hard to find. Color 1/10th 12k rolled gold cap with a lined pattern. Maroon barrel and section with gold trim. It has pearlescent jewels at either end. 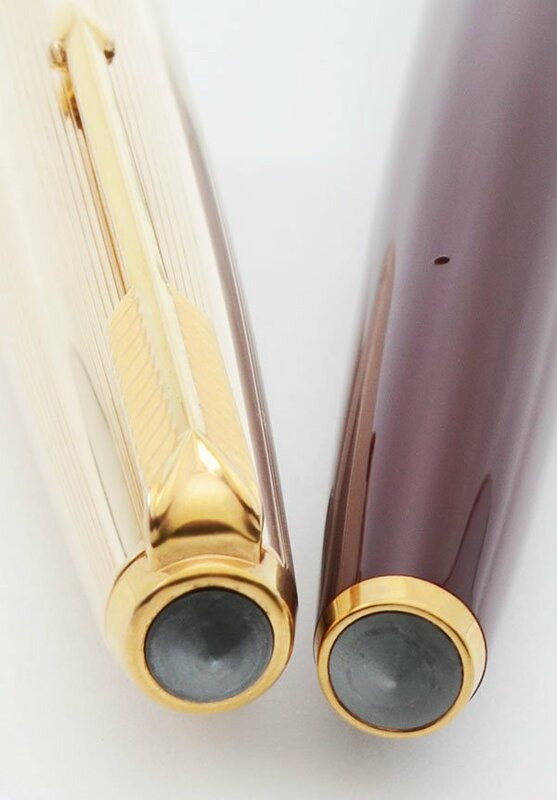 Nib MEDIUM-BROAD 14k gold nib is smooth and firm with great tipping material. We are judging it to be a medium-broad, though it's hard to say what the original nib designation was. 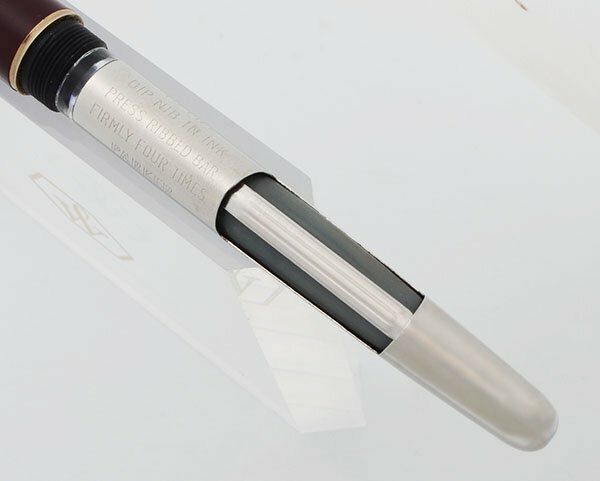 Condition Superior condition for this handsome, shiny pen. The coloration is deep and rich. The barrel and section have only light scratching. The section has some long thin lines of scratching. The cap also has moderate scratching. The clip looks beautiful. The imprints are all perfectly clear. There are no cracks, dents, deep scratches, or dings.